Wow! How intricate and beautiful. I remember seeing this place for afar and being very impressed. Sigh ... it is so beautiful. Wow! I love that. And it's so clean looking. They must take great care of this facade. There is quite aa lot to see at this entrance. 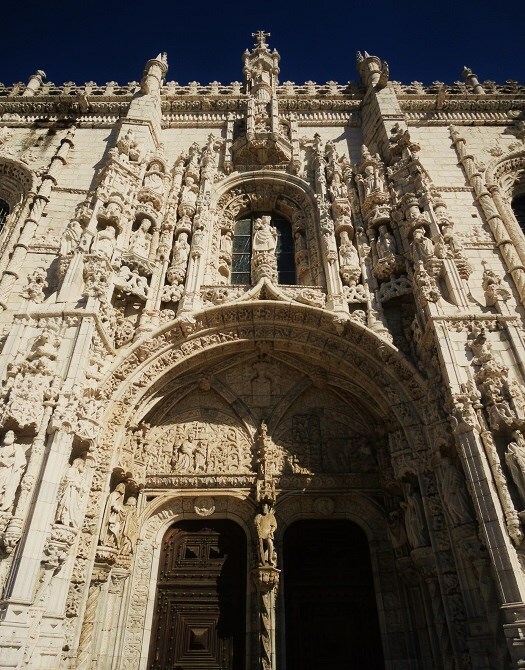 One of Lisbon's most beautiful monuments! So intricate indeed!! And you've caught the details so beautifully, Jose!! Awesome! Thanks for sharing -- as always!! Hope you're ready for a great weekend!! So much craftsmanship on display there, JM! Estive no Monastério de San Gerônimo há dois anos e fiquei perdidamente apaixonada com sua arquitetura.....sublime!!!! Gorgeous.I love all the detailed carving. And this is the side entrance! The front must be amazing. And look at that sky. This is one detailed piece of art on this Monastery. I would think my neck would be stiff after looking up. Oh my! So much intricate detail Jose.. can just imagine how many years this took to complete.